You hear it all the time. Fibromyalgia is "thought to be the result of overactive nerves"
We also know that fibro affects other major systems of the body, often causing symptoms from one system to interplay with symptoms from another system. This pain can literally get on every nerve of the body, while causing other symptoms to be "reactive" so to speak. Let's look at the role of Substance P and how this affects pain in the fibro body. There are two sides to the fibromyalgia nerve pain “coin”. 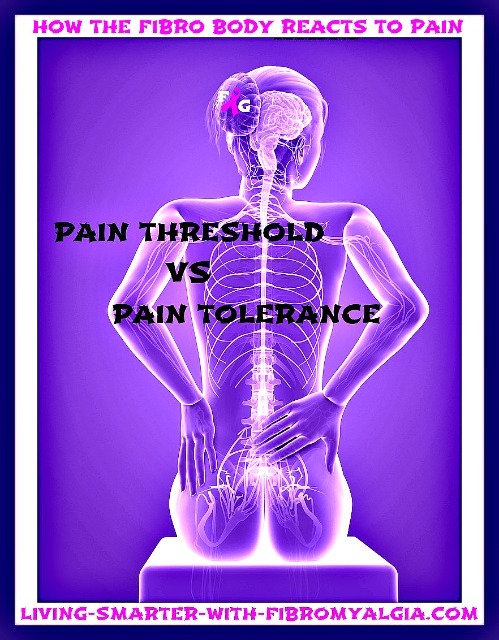 One side is pain threshold; the other is pain tolerance. To understand fibromyalgia pain threshold, you must understand the role of Substance P in the fibro body. You may have heard of this in your research and wondered what in the world is this thing called substance P? And how does it relate to your fibromyalgia? Substance P is a peptide that is released through stimulation within the nervous system. It is involved in regulation of the pain threshold. It has been found that people with fibromyalgia often have increased levels of Substance P and this can increase or heighten sensitivity to pain and other stimulus. Nerves become more sensitive which in turn can exacerbate many symptoms within the fibro body. Because Substance P is involved in the nerve pain threshold, people with fibromyalgia tend to feel pain or stimuli more quickly and more intensely than non-fibro people. More research continues regarding the direct correlation between Substance P and fibromyalgia. Allodynia is one symptom within fibromyalgia where pain is intensified due to the over activity of the nervous system. For example, you may feel greater pain or "sensations" when getting an injection at the doctors office due to the more sensitive nerve endings near the surface of the skin. A light massage may feel good one day but you may not tolerate the lightest touch the next day. Paresthesia is another condition related to fibromyalgia and nerve pain. Many people with fibromyalgia complain about increased nerve pain in the hands and feet. I hear this often. Pain that burns and radiates around the top or bottom of the feet or around the toes. Maybe you have numbness around the bottom of some of your toes. And what about your hands. Why are they so sensitive to touch and temperature? Well see, there are even more nerve endings here because this is where we "feel" everything we touch. Imagine if those nerves weren't sensitive to temperature for instance, you would burn yourself from touching a stove or hot plate. So the body has it's own built in "fire alarm" so to speak. The only problem is when nerves over react or become overly sensitive and are screaming danger on a constant basis. It is important to understand that the pain threshold is not the same as pain tolerance. Many people with fibromyalgia and related conditions have lived with chronic pain for years and have learned to ‘adapt’ to the pain which in turn can actually increase pain tolerance. The ‘threshold’ simply means the point at which pain or symptoms occur… which happens to be more quickly and more intensely for people with fibromyalgia. Nerve pain itself can be insidious. And, it's not only the pain but "sensations" on the skin such as feeling something is crawling on your skin or brushing against you. Different than allodynia but similiar in that it can affect the nerve endings close to the skin. In fibromyalgia, the nerves tend to be over-active. This can occur anywhere in the body and also affect the extremities. Some symptoms will correlate to the autonomic nervous system and myofascial pain or trigger points. If the fascia is constricted or many trigger points are present, this can press on or entrap the nerves. That is why I also recommend hands on Myotherapy (working the trigger points) done by a trained therapist. Release of active trigger point areas can in turn help to relieve constriction and nerve pain. Be sure that your therapist understands fibromyalgia and the need to proceed slowly. Also visit our video section in the living smarter with fibro page for other tools we use for addressing myofascial pain. Remember, we are not looking for ways to "cover" the pain. We believe in and utilize therapies that often work in two ways. To relieve pain while getting to the cause of the pain. Never as a false cure or cover up because that is not how fibromyalgia works. I believe the distinction between "threshold" and "tolerance" is also important for friends, family members and employers to understand. The point at which a person with fibro actually "breaks down" may be much further down that road of pain and symptoms than anyone can imagine. And if you do have it, try the least invasive remedies first, while we help you in getting to those root causes over time. The Penetrex cream below is one of the more natural creams without some of the additives in other nerve creams that we don't care for. Now, here’s the thing about nerve pain tolerance and fibromyalgia. We have to be careful about not decreasing our pain tolerance through overuse of medications that will only continue to add more side effects and also decrease pain tolerance. We are never "all or nothing" here. So let's say that for some people this might mean simply working with your doctor to be very sure you are taking ONLY the lowest effective dose. Then implementing other things to support partial or total elimination of any medications that are causing greater harm. Regarding medications, you might say … "well, that’s ok…I don’t want to be in pain." Of course not, but it has been well verified that these medications are not the answer for properly managing fibromyalgia. And in fact, they do more harm through damage to vital organs and dangerous side effects. Continuing to create a greater dependence only compounds the initial problem. And, if you are taking meds for fibro or other conditions, work with your doctor regularly to be sure that you are only taking the 'lowest effective dose'. I’m surely not advocating that anyone suffer more than they have to. But the whole premise of our website and protocols is based on the very programs that I have used and continue to use with myself and others. I believe I was "forced" in a sense to utilize other methods of dealing with fibromyalgia and that is really what the entire website is all about. I have experienced some of the most excruciating pain since a young age, and I have truly had to learn how to be better and smarter at managing that pain. Symptoms within fibromyalgia, pain, chronic migraine are so unpredictable and medications just don't work that way. They also don't address the root causes. Working with people who have chronic illness and fibromyalgia, I can tell you that people have many perpetuating factors around them that they are not even aware of. Bottom line is that although a fibro body’s pain threshold may be low, often times people with fibromyalgia have a very high pain tolerance. Living with daily pain and symptoms of fibro and any related conditions takes everything we have. This is not simply a matter of taking a pill and getting on with our lives. Being proactive despite living with complex fibromyalgia is one of the most rewarding things I have ever experienced. See, it is because we take nothing for granted. And, by the way, this does not mean that our previous lifestyle was to blame. It does mean that now we must use every component of a healthy lifestyle to our advantage. It’s always better to be proactive than to just "adapt" to the illness. Being proactive…staying empowered….that is where we can begin to balance out the threshold vs. the tolerance factors. There is great reward in that, a foundation on which we can build upon. Try activity on whatever level is right for you, keep working at it. Follow on my fitness page for safe and effective workout ideas and more. Fibro Fit People. If you are having nerve pain in any form including the extremities, consider the suggestions we have found helpful to mediate pain. You know this already, but "sitting" through nerve pain can be very uncomfortable. Being proactive through light movement and experimenting with compression wear is the best idea to prevent this kind of pain from worsening. See our foot pain article here ... Foot pain and fibromyalgia. Also try natural remedies such as lobelia tincture, which is great for nerves. I started using a low dose of Lobelia tincture many years ago, and find it is helpful with nerve pain and anxiety related symptoms. When using a tincture, we use only a few drops every day, so this will last awhile. Lobelia can help with muscle tension, nerve pain and will help the body to relax before bedtime. Please note that the taste is very strong and putting in warm water is helpful.